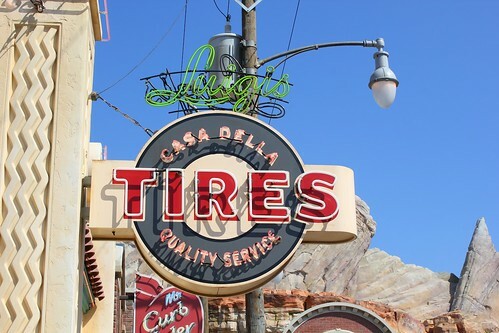 Though Radiator Springs Racers wins the Piston Cup for the most innovative and exiting new attraction at the Disneyland Resort, it’s Luigi’s Flying Tires that comes in a close second providing the most unusually fun experience in Cars Land. 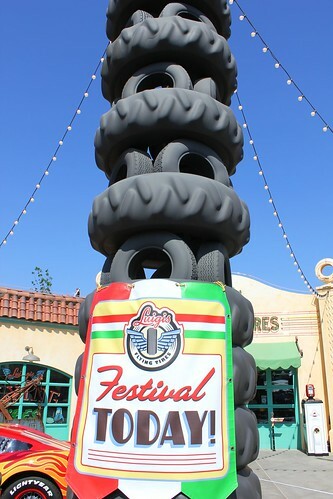 A throwback to Disneyland’s long-gone-but-never-forgotten Flying Saucers attraction, Flying Tires sends Disney California Adventure theme park guests floating on air, bumping, spinning, and laughing together – but only if they’re willing to try. 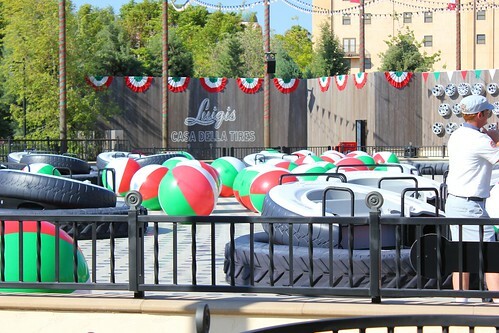 Luigi’s Flying Tires is anything but a passive experience. 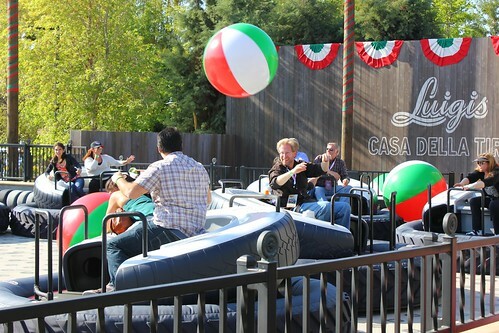 While most Disney rides simply have guests buckle in and go along for the ride, this attraction requires riders to take an active role in creating the experience by leaning side to side, shifting the flow of air underneath each of the massive tires, increasing momentum, and ultimately picking up speed. 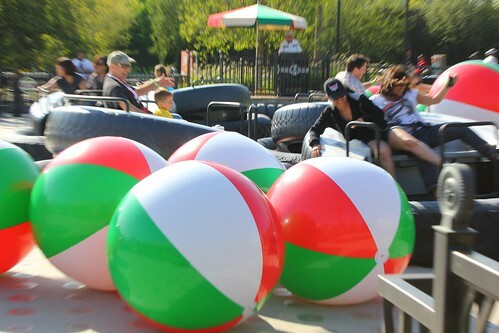 Adding to the simple thrills of the ride’s manual movements, Disney floods the Flying Tires attraction with giant-sized red, white, and green beach balls, which guests are free (and encouraged) to pick up, throw, punch, and bounce while gliding their way through the ride. It’s not nearly as complex of an experience as Radiator Springs Racers (or most other Disney rides for that matter), but it works for a few minutes of fun in its most basic form. Take a spin on the tires with me and a few friends in the video below. 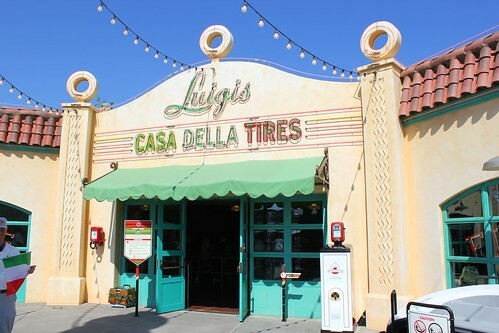 Luigi’s Flying Tires is housed within Luigi’s Casa Della Tires, replicated exactly as it’s seen in the “Cars” films. 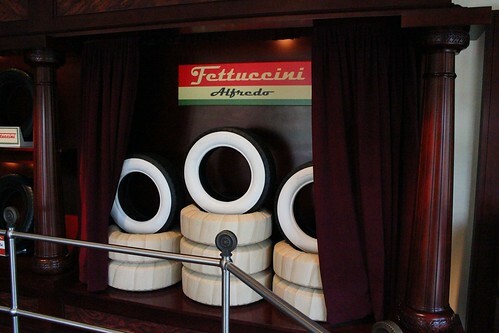 But Disney never simply rolls out an attraction without a story to go with it and in this case it’s a special day at this place of business for the little Italian vehicles, Luigi and Guido, as the Festival of the Flying Tires has begun. 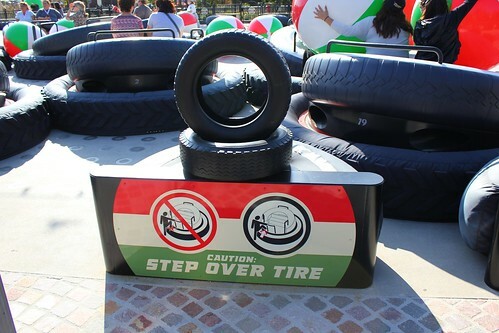 Parked outside Luigi’s Casa Della Tires is an example tire ride vehicle on which guests can get accustomed to climbing in and out without stepping on the tire itself, an important note to keep the tires in action. 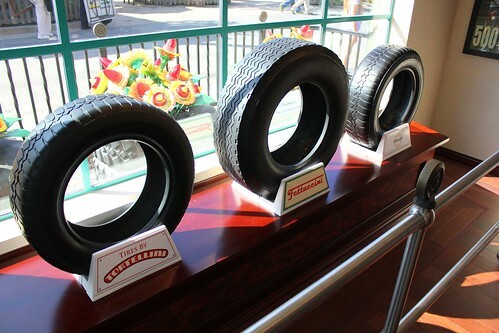 Once inside, the immersive nature of the rest of Cars Land and Radiator Springs continues through the queue, where rows of uniquely-named tires line the walls – the equivalent of a designer shoe store in the “Cars” world. They’re mostly named after familiar Italian dishes, with the most desirable being white-walled Fettucini Alfredo brand. 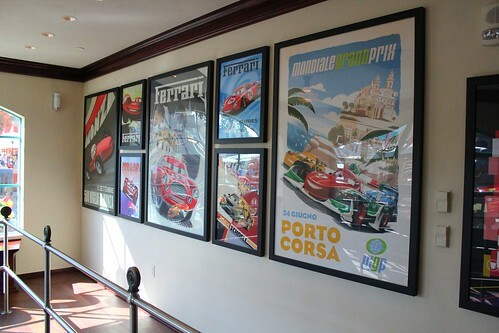 Clever posters hang around the tire racks touting Ferrari brand vehicles – Luigi’s favorite, naturally – and other punny signs, like Lightyear (instead of Goodyear), as well as one of the few “Cars 2” references to be found within Cars Land, an image for the film’s climactic Porto Corsa Grand Prix race. Rounding the corner, guests come across a dressing room of sorts, where cars can drive up to try on tires before buying from Luigi. It serves as a great photo op for human guests waiting to ride. Emerging outside, guests catch the first glimpse of the large “air hockey” style arena that houses the Flying Tires attraction. 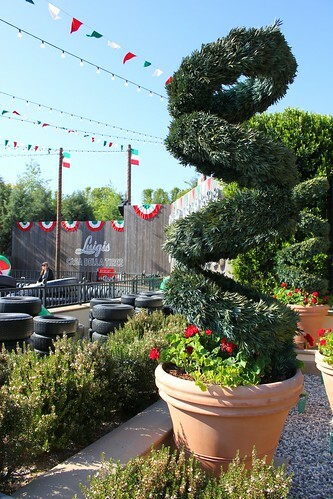 Adorned in banners and flags of the Italian flag colors, Luigi’s Flying Tires is ready to celebrate the festival. 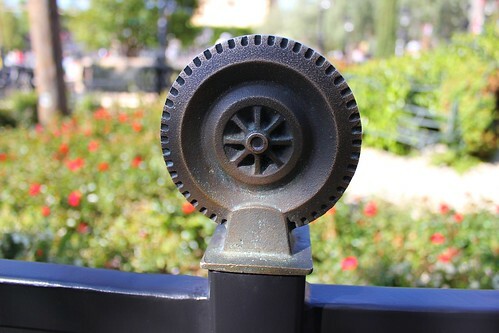 Tires are clearly the theme, down the details of fence ornamentation and topiaries. 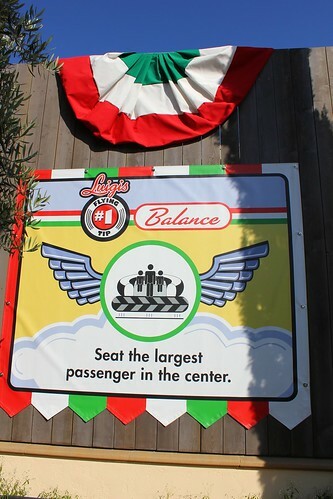 Guests can ride alone or with others, but the largest person should sit in the middle as to not throw off the center of balance of the tire vehicles. As long as everyone in the tire sits straight, the tire will (should) not move at all. Whether one person or a group, all who ride in a tire must lean together – and keep leaning until the tire starts moving. It won’t happen immediately, but when the tire begins to pick up momentum, the speed just keeps increasing, as does the fun. 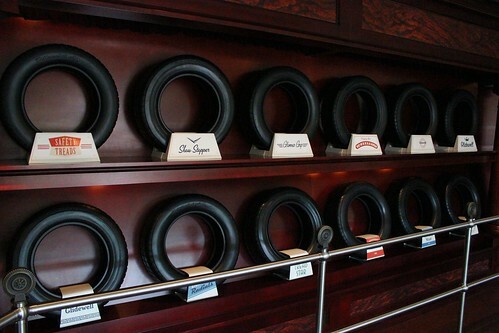 Guests experiencing frustration with their tires not moving are likely not committing to this step. 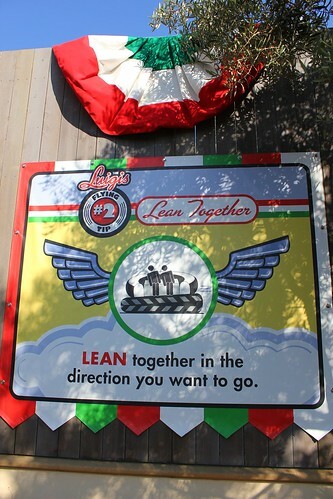 When the sign says lean, it means LEAN. Only those who make a real effort will take control of this unique attraction. Of course, it’s possible to go too far and lean to the point where the seating platform collapses the tire underneath, creating a dead stop. It would take some serious leaning to get this to happen and shouldn’t be a concern for most guests – but it is possible. 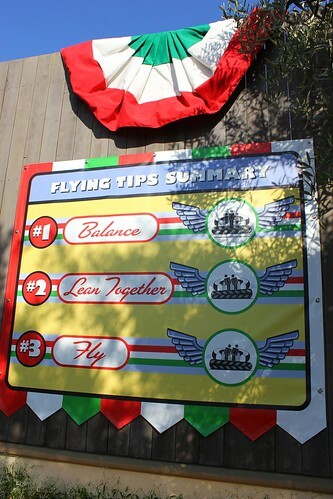 In case guests waiting to ride miss the above three signs, Disney summarizes them all in one large sign just before boarding. Despite these colorful graphics, many riders still expect the ride to do all the work for them while they simply sit back and relax. That’s simply not what Luigi’s Flying Tires is designed for. 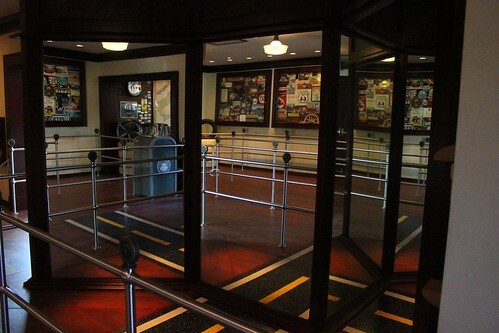 Instead, a little effort goes a long way to make this attraction interesting. 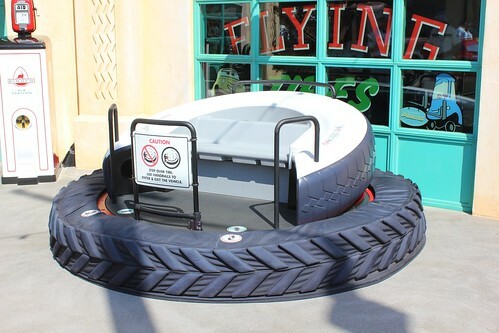 Repeating the instructions from outside the ride, guests entering the attraction are advised to step over the inflated tires and onto the seating platform instead. Tires will buckle under the weight of a person and are not intended as a step. It’s not difficult for an adult to climb in but small children will need some assistance. Finally, before hopping aboard a Flying Tire, it’s recommended to grab a giant beach ball and hang onto it until the ride starts. Arming yourself with a ball to begin with will, pardon the pun, get the ball rolling on the high-flying fun of bouncing them around. 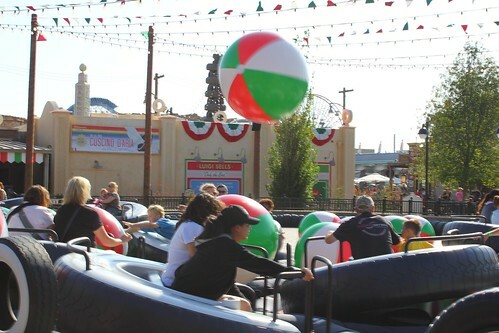 It’s difficult to grab a ball that’s on the ground once the ride is in motion, though possible to roll/ram one into another tire or the side of the arena to get it to pop up into the air. With so many of these colorful balls floating around, the resulting experience is non-stop laughs, particularly when riding alongside and bumping into friends and family. 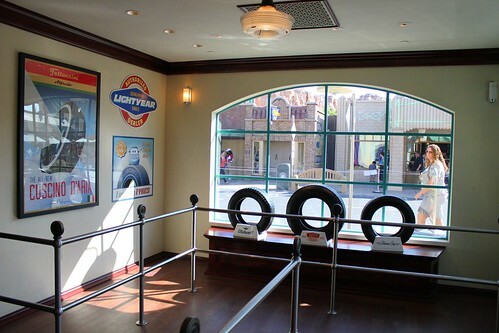 With many Disneyland guests unwilling to try to do anything more than simply sit and wait for the tires to move, expecting more than the attraction is designed for, it’s possible this ride won’t last in its current form. The old Flying Saucers attraction was at Disneyland for just 5 years back in the ’60s before the park gave up on it. Even 50 years later, technology can’t overcome a guest’s unwillingness to exert themselves. Luigi’s Flying Tires isn’t for everyone. Those looking to sit down and watch a ride unfold around them are much better off waiting in line for Radiator Springs Racers or any of Disney’s many other classic rides. 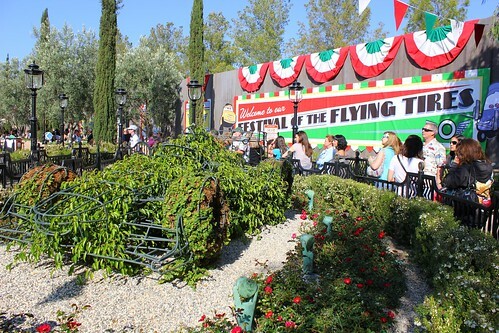 But guests interested in capturing a bit of the short-lived magic of the Flying Saucers or simply wanting to join in for a uniquely good time unlike any other Disney ride should give the Flying Tires a whirl. Those willing to put in the effort will come out smiling. Personally, the problem I have is that it probably was amazing in 1960 but for 2012 then this wasn’t very impressive or fun. 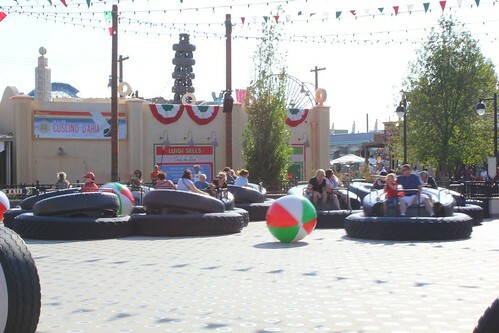 (You can tell by how they try to distract how slow the ride is by giving us beach balls). 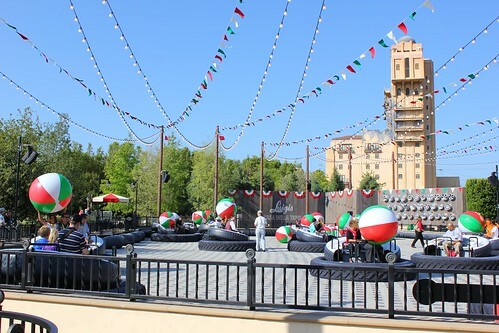 The Mater ride is okay and RSR is amazing but I wouldnt mind seeing this ride get replaced with something better once the “new” excitement fades. Not every ride can be an E-ticket. Mater’s Junkyard Jamboree is fun for what it is, and the humorous music makes it better. Luigi’s Flying Tires is everything you make of it and nothing if you don’t. I don’t see the beach balls as distractions but part of the equation. It’s not about speed or thrills but just about having some laughs while putt-putting in circles. Flying Tires is definitely not for everyone but those who can stop thinking of it as a “ride” and instead just a source of entertainment might enjoy it more. It’s not traditional, but it can be fun, even if it’s silly. I don’t see that happening anytime soon. It looks like they spent a lot of money on this attraction. 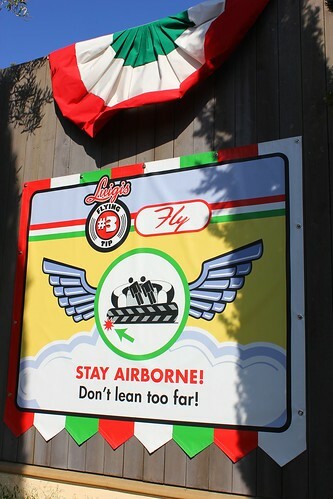 I’ll be posting a full review of Mater’s Junkyard Jamboree on Monday but no, it didn’t make me sick – and I can’t stand the tea cups and often get a little queasy on Dumbo and similar spinning rides. Mater’s doesn’t spin as much as whip you around, with lulls in between. On June 15, my son and I rode on it. The beach balls did not work for me. Today my wife and I rode on it and the beach balls were removed. The ride was a little better and easier to control. Luigi’s Flying TIres was a disappointment but hopefully they will see that and tweek it a bit. I rode it just a day after the beach balls were removed (darn it) but can see why it may have been a problem if you get hit in the face or a teenager falls out trying to get to a ball to throw it. I did ride the Flying Saucers in the 60s and the problem then I believe was the technology to keep them working, but when they worked they worked fine. This time though they made the “vehicle” much bigger (probably to increase “guests per hour”) and — so small children can sit with their parents. Take a look at the films out there of the FS ride– they only sat one and were quite a bit more bouncy and able to careen across the airholes–that is when there was air coming out of the holes.